This is a DOS shareware remake of Namco's classic 1980 Galaxian arcade shooter. 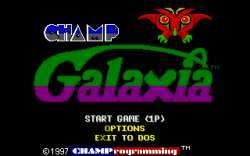 Like the other games in CHAMProgramming's series of arcade remakes, it is remarkable for closely emulating the original, the smooth gameplay and two game modes, the original "Classic" and the enhanced "Champ" mode. The "Classic" mode plays and feels like the arcade machine, with very similar graphics, sound and gameplay: You play a spaceship, moving horizontally at the bottom of the screen, and shooting up at a bunch of Space Invaders-like aliens, which attack you in waves becoming harder and harder with the game. The "Champ" mode is an upgraded version of the classic game with new enemy types - requiring more than one hit to destroy, or equipped with a cloaking device making them nearly invisible - and a variety of power-ups for the player, with create an entertaining variant of the original game. Finally, the game features a variety of options -- one or two player modes, three difficulty settings, adjustable game speed, input by keyboard, mouse or joystick (Champ even released a "Champ cable" that allowed you to play the game with digital joysticks), and a high score table to round it all off. It was later made freeware.